Do you need a rotator? Even for antenna enthusiasts it’s a pretty specific piece of equipment that not everyone needs. Ask yourself the following questions? Are all my local stations in the same place? Are there stations I’d like to get but I need to move my antenna all the time? Am I over 40 miles away from some of these broadcast towers? Do I do most of my viewing on just one TV? If you answered “yes” to all of these, you might want a rotator. If you’re closer than 35-40 miles you could probably use a Winegard Metrostar, but beyond that range, an omnidirectional antenna probably won’t work for you. A rotator sits between your roof-mounted mast and your antenna and spins it, by remote control. It’s as simple as that. It lets you point the antenna where you want to point it. Personally of all the rotators I’ve tested my favorite is the new Channel Master CM-9521HD. It addresses some of the complaints I have had about other rotators. It’s sturdy, easy to install and comes with a nice wireless remote. It also has memory settings so it’s easy to get my favorite channels when I need them. Let’s take a look at the 9521 in action. As you can see it’s a handsome little piece of equipment. Here, I’ve mounted it at ground level so it’s a little easier to photograph. Let’s look at two more angles. I had no problem mounting it to a 1.5″ outer diameter fencepost for the bottom. However, the top clamps will only accommodate a 1.375″ outer diameter mast, so if something that slim isn’t available near you, choose this mast from Solid Signal. Here’s an image of the top clamps attached to a 1.25″ mast. This is a shot of the inside of the CM9521HD. I’ve opened the panel to expose the rotator wire connection. As you can see the outer casing is a very serious, thick metal bit and the motor itself looks nice and beefy. The rotator can be purchased in a kit with rotator wire if you don’t have any. It’s just plain old 3-conductor wire but unless you happen to already have a bunch of it, it’s best to order it from Solid Signal and know you’re getting the right stuff. It connects, as you see below, to the three spring terminals. It’s very important to note when you’re installing this, which wire goes into which terminal. You’ll need to duplicate the exact order when you connect it to the other side. This is the back of the base unit. See how I’ve attached the wires in the same order as they are in the rotator. As you can see the base unit is a very nice, unobtrusive little bit. You can move it manually using the front buttons, but you’ll likely want to use the supplied remote which will let you set memory locations for your favorite channels. Of course it does. Here’s a little animation of it rotating. It may take a moment to load. Rotation is actually even smoother than this animation shows and reasonably speedy for an antenna rotator. If you need an antenna rotator, this is going to be a great choice for you. I think you’ll be pleased as I was with the build quality. The supplied instructions are very good and I would expect it to last for years. 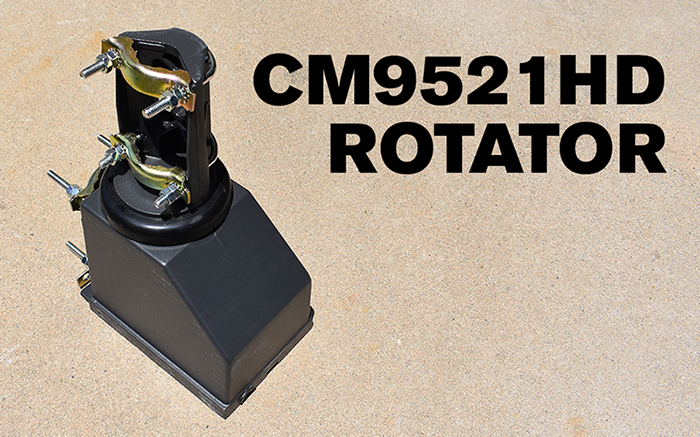 Shop now for the Channel Master CM9521HD rotator!